Laurel Falls Trail – Described as moderate in difficulty, this 4-mile roundtrip hike rewards the hiker with a visit to one of the favorite waterfalls in the Park. This trailhead is very busy during the summer and weekends year-round. Access to the trailhead is via the Little River Road halfway between the Sugarlands Visitor Center and Elkmont Campground. The hiker can travel an additional .75 mile beyond the falls to see an old-growth forest. 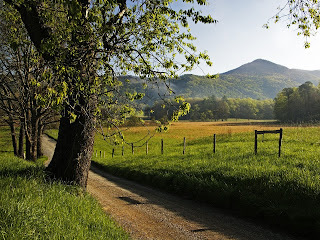 Alum Cave Bluff Trail (photo right)- From the Sugarlands Visitor Center, drive 8.6 miles east on Newfound Gap Road. There you will find two parking areas, where a gravel path leads to The Grassy Patch and the beginning of a 2.3 mile hike to Alum Cave Bluff. This moderately difficult hike is 4.6 miles round-trip or 5.1 miles on to LeConte Lodge. The round-trip to the cave bluff takes about 2 and 1/2 hours, but allow about 3 and 1/2 hours to LeConte Lodge. 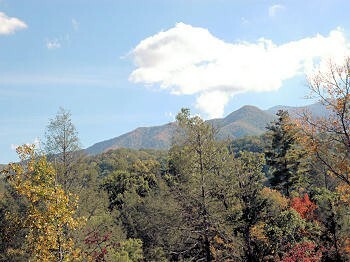 The Alum Cave Trail is the most popular and well-known route to Mount Le Conte. Features include Arch Rock, 1993 summer storm damage, Inspiration Point, Alum Cave Bluff. Rainbow Falls Trail – The Rainbow Falls Trail is fairly challenging if completed all the way to Mt LeConte. Allow an hour and a half to Rainbow Falls and four hours to Mt LeConte. Hikers will gain nearly 4,000 feet in elevation by the time they get to Mt. LeConte. The Point of departure is at Cherokee Orchard Road – Turn at light #8 in Gatlinburg and follow the Airport Road 1 mile out of Gatlinburg into the Great Smoky Mountains National Park. The name will change from Airport Road to Cherokee Orchard Road. About 2.5 miles after entering the Park, Cherokee Orchard Road approaches the Rainbow Falls parking area. You will find the trail head at one edge of the parking area. Features of interest include the 2.8 mile point when you arrive at Rainbow Falls. At the 6.6 mile point you will come upon an Alum Cave Trail junction which leads left 0.1 mile to the LeConte Lodge.